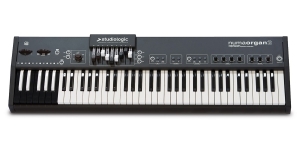 Studiologic Numa Organ is based on modeling technology (without samples), has a 73-key keyboard, and is a clean body, without any other tools. It is made of metal. Numa Organ offers 3 multi-timbral parts to the user's disposal: upper, lower, and bass pedals that sit in MIDI channels 1, 2 and 3 respectively. The 73-note keyboard is excellent and fast in action. Dynamic Touch has 3 modes: on, off and blinking, which correspond to the MIDI control of only internal sounds/only external sounds, or both. The instrument has knobs for adjusting the effect of overdrive, reverb, key press which remind of Korg CX-3 from the 80's. A small drawback of Numa Organ is that in addition to selecting different models of the organ, it is not possible to change any settings. By the way, as for the models, Numa has several kinds of organs that can be selected by holding the Sound/Preset button until it starts blinking, then pressing one of them. Three models cover B-3, A-100, C-3 organs, and each of them sounds fantastic. In addition, in this version you can find a church organ and 3 transistors of combo-organs. The basic sound of them is quite authentic, but each model of the organ in the instrument uses Hammond 9 drawbars. With this organ, you can reproduce convincingly the compositions of such bands as The Doors and Animals.